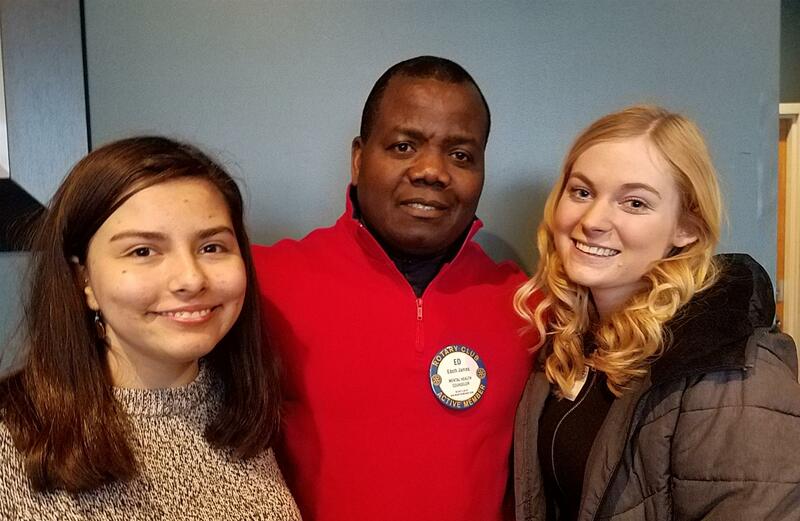 · Ellen Dunn, a Rotary Global Grant Fellowship Scholar sponsored by our club. Ellen is studying in London. · Sofia Valdez, our outbound exchange student for next year. Sophia will represent us in Spain. Sofia (left) and Ellen (right) are pictured with Ed James. Bev Aplikowski appealed to all of us to get our sold tickets and meal selections for the Gold Plate Dinner to her ASAP. Nicole Ulrich reminds us that the Benedictine Health Center at Innsbruck will hold its 12th annual gala on May 17th. Contact Nicole for more information about this really fun event. Margaret Johnson encourages us all to consider increasing our quarterly contributions to the Rotary Foundation. If you haven’t already done so, increasing your mandatory $10/quarter contribution to $25/ quarter will help us achieve our club goal of each member contributing $100 or more to the Rotary Foundation each year. Watch your email for more details. Next year’s outbound exchange student, Sofia Valdez, introduced herself to the club. Sofia is 16 years old and a St. Anthony H.S. student. When she’s not working at Hazel’s Northeast Restaurant, Sofia volunteers with several organizations including Step-Up and Minnesota Interfaith Power and Light. She is a self-described energy activist. Sofia sweetened her introduction with delicious blue and gold cookies (Rotary colors, of course). Our speaker today was Lisa Baker, Program Manager at the Ralph Reeder Food shelf. Lisa has been with the Food Shelf for 21 years. 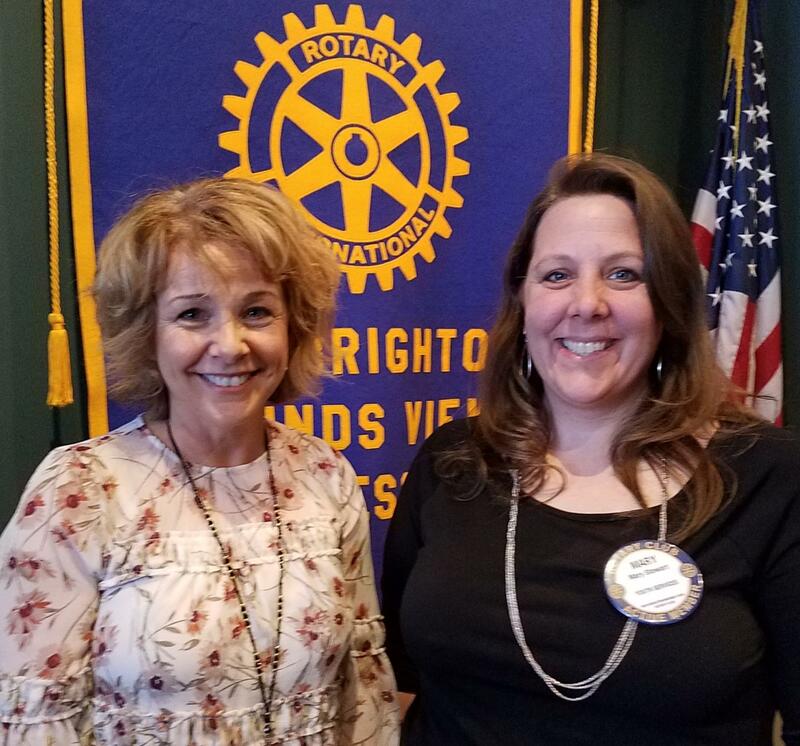 Lisa began her talk with a video of the Grand Opening Celebration at their new location in the Silver View Strip Mall at 2544 Mounds View Boulevard. Lisa noted that over 400 people attended the celebration. Lisa said that hunger and food insecurity are a big problem, even in the suburbs. One in eleven households is affected by hunger in rural, suburban and urban areas and one in seven children go to bed hungry each night. One third of Mounds View Public Schools students qualify for free and reduced lunches. It’s not just kids and young families that don’t have enough food, though; 10% of the food shelf’s clients are seniors. In 2018, Ralph Reeder gave out 667,326 pounds of food and goods to 26,520 duplicated people and they are currently serving 963 families each month. This reflects the trend that shows a nearly 100% increase in food shelf usage since 2010. People in need of food call the food shelf to make an appointment to meet with a staff person to determine eligibility. If eligible, they shop for their own food or other needed items. At checkout the food is weighed to document the benefit. The Food Shelf also participates in “Schooltrition” programs to get food to children in school. These programs include Snackpack, Smartsnacks and Pop-up School Markets. Over 400 students are enrolled in these programs district-wide. · Spread the word about hunger and the Food Shelf’s efforts to fight it. Lisa and Mary Stewart are pictured below.